Bill and I finally had some time to “go on a date” last night—dinner and a movie. As we weren’t very hungry we ended up at the Taco Bell in Shallotte, which we had never been to. I had the Steak Cantina Bowl and it was really good, but a lot, so I couldn’t finish it. Then we went to see “2016.” I was surprised by how well done it was, and that considering all the political stuff we’re being bombarded with lately, that it held our attention. Actually, we were riveted to our seats. We’re going to try a date night again soon, hopefully we get to see Bourne Legacy before it leaves the theaters. On the book side, I just read the most amazing book (actually heard the most amazing book as it was an audio book). 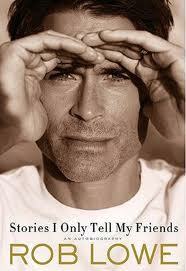 Stories I tell My Friends by Rob Lowe, read by Rob Lowe. I’ve never really been a great fan of his, although I loved him in The West Wing, but I am now. His book about his life to date is very interesting, unbelievably so. There are so many famous people woven through it that you are allowed an intimate glimpse of, that it pulls you along. One thing he said in particular that really resonated through me was: “Looking back, I have to wonder at the mystery of destiny and fate. I marvel at the mercurial forces and fortune and am reminded that one must be ever vigilant to stay on one’s path without envy of others.” I think that can apply to all of us. After the phenomenal success of E.L. James this year, I’ve taken to carrying his quote in my wallet! Rob Lowe’s book was extremely well written and I would recommend it highly. I have it on CD if anyone wants to borrow it. But it’s so good that I want it back for my keeper shelf. Who am I kidding? Keeper shelves.